My feet are not something that bothers me… at least at this point in my life. However, I know that many of my readers face this dilemma as I have heard from you. I have turned down a few shoe partnerships because I did not like the style of the shoes. When it comes to shoes… it’s always been style over comfort for me. And I know that’s easy for me to say… when my feet don’t hurt. But then I tried on the Jambu Rimini Leather Bootie with memory foam foot beds and a light bulb went off. Yes! You can have a stylish bootie that also offers comfort. You can check out all their new arrivals here and boots and booties here. I recently wore this brand new pair of booties on an all day shopping trip and felt like I was wearing my favorite slippers. I truly felt like I was walking on air. I have three stylish friends that are all Brand Ambassadors for Jambu so was intrigued about the brand and the comfort the shoes offer. Jodie, Dawn and Jess are all three women I admire and who also inspire many other women. I knew they must have been on to something! I’m happy to say that Jambu has offered to provide you, my readers a discount code: SILVER18 for 15% off any jambu.com purchase, now through 10/31. Thank you to Jambu for sponsoring this post. If you are looking for comfortable booties for women and decide to check them out and purchase a pair, I hope you find them as comfortable as I have. 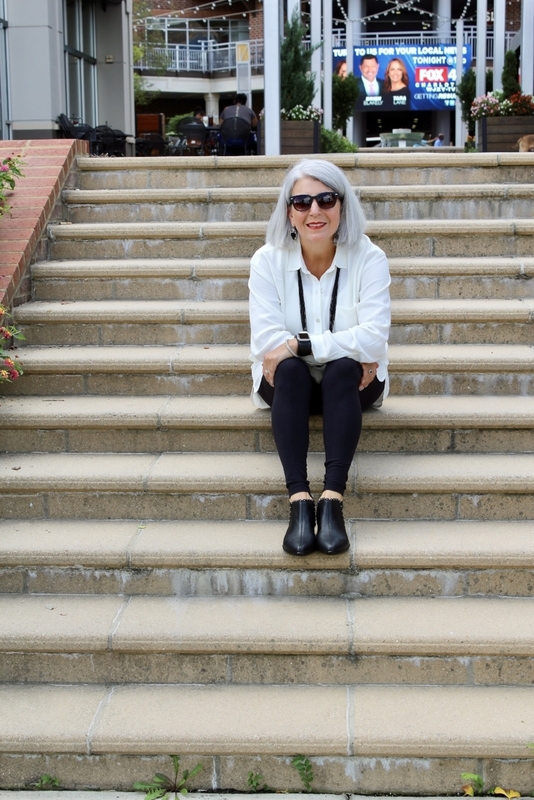 My goal is to share chic ageless style and endless fun, from a sincerely silver perspective. Including fashion, beauty, and relevant lifestyle information as we share this journey together! Thank you for reading my blog!